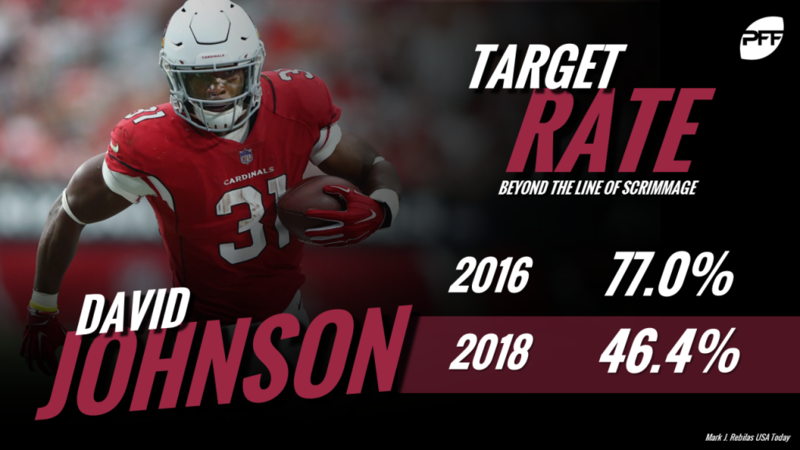 Next Gen Stats’ depiction of Arizona Cardinals running back David Johnson’s rushing direction has made waves across the Internet, leading the masses to jump to the conclusion that he is simply handicapped by poor play-calling and a shell of himself as a result. The aforementioned jump, however, is what’s heading in the wrong direction. In 2016, Johnson turned in the career year that propped him up as one of the league’s up-and-comers at the position prior to suffering a season-ending injury in 2017. He recorded 522 of his 1,239 rushing yards (42.1%) inside the tackles, and only 45.8 percent of his rushing yards came after contact on such runs– good for the fifth-lowest percentage among qualifiers. He also averaged 1.75 yards before the first contact per attempt on inside runs, the 10th-highest figure on inside runs. The breathing room Johnson had up the middle in 2016 has not followed him into 2018. So far this season, Johnson has averaged just 0.91 yards before first contact per attempt and gained 70.5 percent of his yards after contact on his 59 inside runs, both figures falling drastically in the wrong direction compared to his stellar 2016 campaign. Of course, watching Johnson run into a brick wall 0.91 yards beyond the line of scrimmage on inside runs surely pushed now former Cardinals offensive coordinator Mike McCoy to consider running his feature back in another direction. However, what likely kept McCoy from doing so was the fact that the offensive line play along the edge was even worse than the interior. Johnson has averaged 0.67 yards before first contact per attempt on outside runs this season, ranking 30th among 42 qualifiers. As a result, he has rushed for just 146 yards across his 45 outside runs (3.2 YPC) and totaled a whopping 84 percent of the 146 yards after contact. 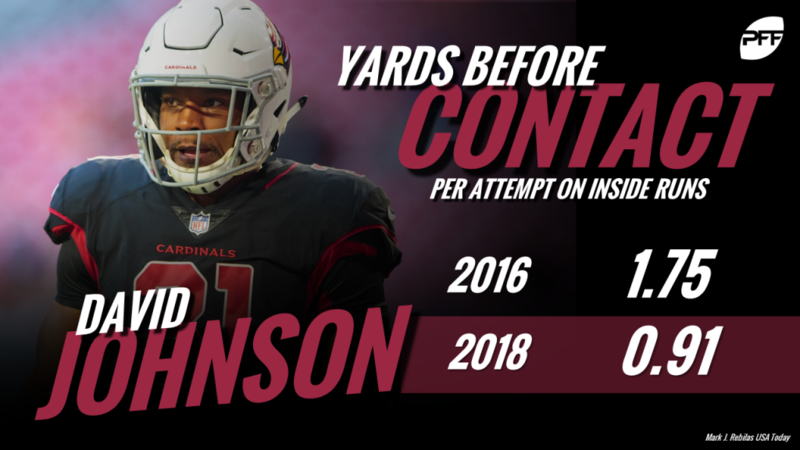 To add perspective, Johnson’s yards before first contact per attempt on outside runs in 2016 (1.70) more than doubled the breathing room he’s getting behind the Cardinals’ offensive line this season. Rushing inside or outside the tackles this season, Johnson has faced much tougher sledding compared to his breakout campaign two years ago. In 2016, fewer than 60 percent of his 1,243 yards came after contact, and he had at least two yards of breathing room on 41.3 percent of his carries. Now, seven games into the 2018 season, 74 percent of his rushing yards have come after contact, and he’s rushed for two or more yards before first contact on only 31.1 percent of his carries. Yes, Johnson’s forced missed tackles per carry has dropped from 0.15 in 2016 to 0.08 this season, but it’s much harder to make defensive linemen miss when their meeting you as you take the handoff than linebackers and defensive backs at the second level. Put simply, the root of Johnson’s drop-off in production is the play of his offensive line – not the direction he’s running the football. Four of the Cardinals’ five starting offensive linemen have earned run-block grades under 60.0 this season, and their best run-blocker, D.J. Humphries, has just a 65.6 run-block grade through Week 7. Now, while McCoy can’t take all the blame for Johnson’s regression on the ground, his usage of Johnson in the passing game was indeed baffling. In 2016, Johnson was an even better receiver than he was a runner, as he led all running backs in receiving grade (90.0) and hauled in 80-of-107 targets for 879 yards and 42 first downs – all of which stood out as NFL highs. McCoy, however, went away from targeting Johnson roughly seven times per game when he returned from injury this season and instead targeted him just four times per game on average. Additionally, Johnson played 34.8 percent of his receiving snaps at either slot or wide receiver and recorded 40 percent of his total receiving yards on such snaps in 2016. This season, he’s played just 18 receiving snaps away from the backfield (11.4 percent). In addition to going away from advantageous pre-snap alignment for Johnson, the Cardinals have decided against targeting him beyond the line of scrimmage as often as the team did in 2016. In Johnson’s breakout season, he picked up 77 percent of his receiving yards and 74 percent of his targets on passes thrown beyond the line of scrimmage. In 2018, only 46.4 percent of his targets come ahead of the line of scrimmage. The current state of the Cardinals’ offensive line isn’t changing anytime soon, so pulling for a turnaround on the ground for Johnson with a few more outside runs isn’t realistic. However, turning back the clocks on Johnson’s usage in the passing game is more than possible, and new Cardinals offensive coordinator Byron Leftwich would be smart to do so to get the best out of the team’s top skill player moving forward.